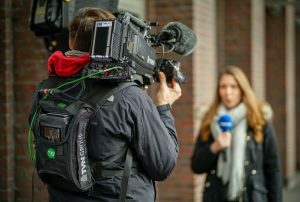 OB provider TVN Group and live IP delivery company TVU Networks are working together to provide the German broadcast market with innovative IP video transport solutions to drive easier newsgathering solutions, over more platforms. The mobile transmission unit can transmit HDSDI signals to a fixed point independently of video directional radio links, achieve a latency of max two seconds and, Osthaus said, depending on stable internet connection, minimum 0.5 seconds, to the end point almost real time transmissions, while the talkback feedback allows bidirectional audio communication. Osthaus went on: “Since the transmission unit is very small and compact and is controlled remotely, it allows the cameraman a one-touch operation; more than switching on is not necessary here. The remote operator controls the reception position and controls the data stream with regard to quality and latency, so he can instruct and lead the cameraman to the correct or optimal position for the broadcast. “Whereas the location of the transmitting unit basically can be used everywhere in the world, assuming that the medium is the WWW and available everywhere sufficiently, 10MBps is the minimum bandwidth that must be reached for HD quality,” he added. As to what sort of sports broadcasters, and what types of sporting events, Osthaus sees benefitting most from this technology, he said: “Currently this technology is fully usable for all internet productions where the live feed is streamed directly via CDN. For sports taking place in impassable terrain with no transmission facilities, our innovative live IP streaming units are particularly advantageous. “When using central remote control rooms, where the network sovereignty lies with TVN, any kind of live feed from the broadcasting unit into the current broadcast with a latency of 0.5 to 2 seconds latency is possible,” he noted.